When your baby learns a new skill, it is initially very exciting! Your baby rolled over! Your baby is surely a genius and no baby has possibly rolled over as well as your baby just did (nor been half as cute). Am I right? Then reality hits. New skill is cool, yes, and baby thinks so, too. So baby, who has probably previously been quite the good sleeper, starts wanting to do this new skill in bed instead of sleep. The problem comes when baby has the ability to get into the new skill, but not out of the new skill. For example, baby can roll from back to tummy but not from tummy to back. So baby rolls and then starts crying because he is frustrated that he is stuck on his tummy and he is used to sleeping on his back. Or maybe baby learns to stand up, but doesn’t know how to sit back down. He gets a thrill out of standing, but then grasps to the side of the crib in fear because he can’t get back down. Sometimes these disruptions can come not because a new skill is a challenge in some way. Sometimes your baby is just so excited about it that he wants to keep practicing during naps. This can be something as simple as babbling. Then baby practices his new skill long enough that he becomes overly tired and has a hard time falling asleep. I have four children and have experienced a sleep disruption brought on by new skills with each one of them–though different children have had disruptions with different skills (not all of them were disrupted by rolling, not all were disrupted by standing, etc.). Rest assured your baby is normal and will get past this hurdle. Your baby will go back to sleeping as usual–you just have to be sure you don’t reinforce any new habits you don’t want to continue! Impossible to give an exact time line .I will say that it has never been an extended length of time for any of my children with any one skill. Follow the suggestions below and my guess would be it will be less than a week. If you reinforce behavior that you don’t want to happen, it will last longer than that. While it is normal and even inevitable, there are things you can do to help speed up your baby getting past this disruption. Allow your baby plenty of opportunity to practice this skill in the day. 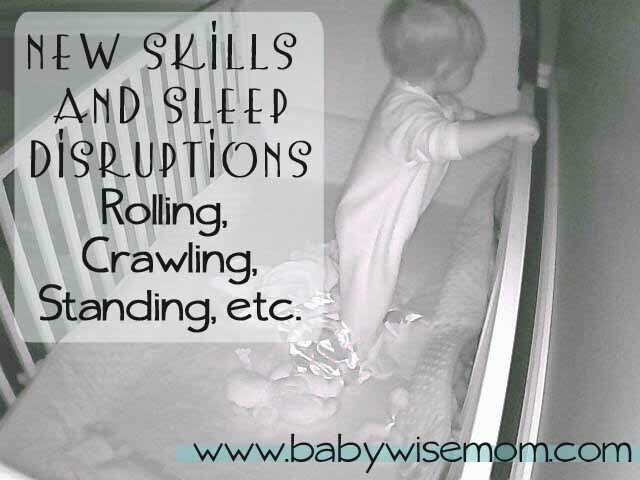 If your baby is obsessed with rolling, make sure he gets plenty of time to roll during playtime during the day. Make it your first priority. Once your baby is accustomed to this new skill, he won’t feel such a driving need to continue this practice during nap time. You might need to move some practice time into the crib, especially for those who have sleep disruptions associated with standing in the crib. Address the issue of baby being able to get out of the situations he is getting into. When Brayden first started standing in the crib, he had a hard time getting back down. He was 7-8 months old when he started standing. Brinley, conversely, was about 10 months old. A ten month old is better at problem solving than a seven month old. Brayden’s disruption lasted longer than Brinley’s simply because he needed more guidance and help in figuring out how to get back down. Brinley was old enough to figure it out herself while Brayden needed to practice in his crib during playtime. There actually are things you can do to help encourage baby to figure out how to do certain skills. To get baby to roll over, put a toy just out of reach. Do get baby to roll from tummy to back, arc a toy from the ground over baby’s head slowly so baby will follow it–his head is heavy and will help propel him over (just do it on soft ground). In this practice, you are also helping baby to build the muscle needed to do the skill. Relate it to yourself. Go ahead and do as many push-ups as you can. Ready—go. And keep in mind, the length of time will vary a lot. I think age is a huge contributor. As I said, Brayden was about 7-8 months when he started standing in the crib. We had two days of big disruptions. Kaitlyn was 12 months when she started and we had only one nap of disruptions. Because your baby is taking longer to fall asleep, he might wake up early from the nap (though some babies naturally adjust and sleep later–go ahead and let baby get an extra thirty minutes in if you are fortunate enough to have such a baby). Since baby is not napping as well, he might need to go down for the next nap or bedtime a bit earlier than usual. Sometimes babies will get themselves into a position they need help out of. That is okay! With all four of my children, I have had to go in at some point to help someone roll back over, lay back down from sitting, or get back down from standing…you can help your baby. There are some things to avoid so you don’t fall into a trap of “accidental parenting” (starting habits you didn’t intend to start). For whatever solution you are thinking of doing to help this disruption, think it through several months and see if it would create more problems in the future. Some people start nursing to sleep and then a month later realize baby won’t go to sleep unless he is being nursed. Remember, this is normal. I know it can be stressful when your baby isn’t sleeping. Do the first four steps I have listed, and then try not to stress about how your baby is taking a long time to fall asleep. When you do need to go in to help out, don’t turn it into a social call. I seriously make myself like another object in the room. I am not happy, mad, amused, or annoyed. I do not make eye contact. I don’t talk. I just gently help baby and then leave the room again. Sometimes the baby will cry when you walk out. No surprise! You have just walked in and left again without taking him with you. But he needs to sleep. None of my babies have cried for an extended period of time after I left. Let baby be and within five minutes, he will likely be quiet. Yes, you can help as needed, but don’t jump in there more often than needed or sooner than needed. Give baby some time to figure it out on his own before you “rescue.” The day will come when baby can do it alone–you want to give baby that chance. During practice time, follow the same rule. Don’t move baby from his tummy to his back at the first whimper. Let him try to figure it out! Some babies do need some cry it out (CIO) to be able to learn to do it alone. Use your best judgement here–I wouldn’t do CIO with a child standing in a crib (though I would be fine waiting a few minutes to see if the baby could get back down on his own before going in). For a baby on his tummy and upset, I feel fine with some CIO. If a baby is persistent about being on the tummy, I figure he is then going to have to learn to either flip back over or to sleep on his tummy. Don’t be afraid of the new skill. I actually took the initiative and taught Brinley to stand up in her crib and how to sit down. Instead of waiting for her to figure out how to stand up and then teaching her how to sit, I just taught her how all at once. Standing was never a big disruption for her. Yes, once she learned how, she had a few naps where standing was a pre-sleep party, but it was never a huge disruption to her overall sleep. Most of the time, these disruptions are happening simply because of a new skill. Sometimes, however, you have something else contributing to the sleep disruption. Sometimes your baby will be old enough and ready to stay awake longer, but you have the same old waketime length. Then he gets in bed, isn’t tired, and starts practicing his skills instead of sleeping. So sometimes adjusting the waketime length will help baby just go right to sleep. Please feel free to share your own experiences and advice on the topic of sleep disruptions! Thank you for your kind words! I appreciate it.I think you are right–they wake at 45 minutes and instead of just going back to sleep, they want to play to work on this skill they are so obsessed with. That is why the wearing off of the novelty factor is important. My baby is 2months and 2 weeks. we have been trying the BW method and for the first week and it was pretty good she would go to sleep for the day at 7:30pm and dream feed at 10pm he would wake up maybe once at 2:30 and up for her first feed for the day. but now she wont take good naps through out the day , she goes to bed at the same time and same dream feed but then she will get up at 2:30am and then every hour after that until about 6:30 when we are up for the day , what do I do and why is she getting up so much? How can I move to a four hour schedule if my 6.5 month old routinely only takes 45 minute naps? I've read all the posts on naps, and nap troubleshooting, and the four hour schedules. I've even read all of the comments. Im still having some trouble after trying everything. For probably about the past month or two my son was only taking 45 minute naps, on a 3 hour schedule which was 7, 10, 1, 4, and 7. Bed time is awesome, always in bed at 8 or before and has slept through the night without a peep since about 8 weeks, literally, not a peep. So I finally just accepted that he only needs 45 minutes? But I knew he could sleep longer for naps because every once in a while, he would nap for 2 hours. We also started solids a couple weeks ago, and he was starting to not be interested in eating so often. I thought maybe going to a four hour schedule would help all of this. So we started a four hour schedule today, and his first nap was two hours!! It was awesome, but then his next nap was only 45, and then another 45 minute nap after. His eating has been awesome, so I know in that aspect he is ready for a four hour schedule, but what do you do when they only sleep for 45 minutes and they are ready for a 4 hr schedule? I know I could do a combo schedule which could help ease with the naps which I will probably try. But seriously…. What do people do????? Hi, I know this is an old post but I was hoping you could provide some insight or tips into my situation… My 8 month old is getting up on all fours in his crib and doesn't know how to get back down. He doesn't know how to get back down during the day, either. I don't know how to let him "practice" this during the day, other than to let him cry for a few minutes at a time until I rescue him (this is during the day). So far, he hasn't woken up in the night, but it has resulted in early morning wakeup and a few disrupted naps. So….. do you recommend that I let him CIO in the early morning (i.e. 5:30am) and naptimes, when there's little chance that he'll cry himself back to sleep? Or should i continue to rescue him? It doesn't always work when I place him back down… especially in the early morning. We do end up starting our day early if he gets too upset. I'd appreciate any helpful tips on maybe helping him figure it out in the daytime, and also what to do when he wakes up in the night? Try googling to see if you can find tips for helping a baby get off hands and knees. There might be some ideas out there. There really is a right or wrong on whether you rescue him or not. You can not and at some point, he would figure it out. But you can also help him until he figures it out in the day. The one thing I wouldn't do is start feeding him before you want to be feeding him in the morning. If you do, you will start a pattern of him needig to be fed becuse his metabolism is used to it. Good luck! My 7 week old sleeps in her belly. She recently started rolling on her side and will not sleep that way. I have read all your suggestions but have 1 question. What if your child isn't capable of developing the skill needed to roll back to her belly? If the child is incapable then you have to decide if you want to goIn and put baby back in sleep Position or do someCIO and let baby learn to sleep in the new position. Hello! So my daughter will be a year old in 2 weeks. In the last month she's learned to crawl, cut two teeth and is going to walk soon. So as you can imagine, her sleep routine has been a mess. Mostly at night. She goes to bed between 6:30-7 and has been regularly waking and crying every 2 hrs until 10 then sometimes through the night. She's been STTN since 4 months so it's been rough! She also started the early morning wake. At this point, we're having to give her a bottle around 5 am to get her to go back to sleep. Any thoughts on breaking the cycle? I do wait to go in for about 5 mins and just lay her down and it usually works. It's just been a long month! Thanks in advance! My daughter is 7 months old and learned to stand. I'm scared she'll fall and hit her head but when I put her back down, she screams. I do it 50 times! I finally rock her to sleep since she won't nap all day!!! Previously to standing, she was napping fine! Thank you for interesting information. I had the same thing with my baby when he learnt how to roll over. And it was not that hard. But now when he learnt how to stand up in his crib, this is kind of challenging. At first it happened the same time as he got really sick so for sure I was picking him up at night as he was on fire and had to take medicine. But now he wakes up at night and gets up and for sure can't go down on his own. So it's impossible to leave him cry it out as he just can't and he will keep crying until I come and lay him down. So I'm really wondering what should I do? Should I teach him to sit down and then I can leave him to CIO or should I just wait? If teaching then how can I do this? Thank you.